An alternative to the self-contained air-cooled Wine Guardian unit is the self-contained water-cooled Wine Guardian system. Water- cooled units are ideal for most high-rise apartment complex applications where most have chiller or cooling towers as part of the building mechanical system. Another application would be restaurants or country clubs that have the ability to tie the system into the dishwashing system. The water-cooled Wine Guardian is physically the same size as the standard air-cooled model but requires no airflow across its condenser. 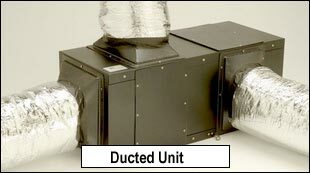 The unit uses water instead of air to cool its condenser, therefore no outside venting or cool air to the unit is required for operation. The system only uses water when there is a call for cooling. When the temperature in the wine cellar is satisfied the compressor and water shut off. The water-cooled Wine Guardian requires two water connections, one (1) in, one (1) out, primary power, drain and wine room side ductwork connections. A 1/2" water line (3/4" for the 2 Ton model) is all that is required for this option which eliminates the condenser fan. The Wine Guardian cooling unit is a professional, USA manufacturered, self-contained climate control unit designed specifically for the storage of wine at cellar temperatures. It is designed for easy installation and operation. Wine Guardian uses digital electronic controls. The entire unit is run tested at the factory and shipped as a single package. All components are of a high quality standard commercial grade. The entire unit is approved by ETL according to UL 1995 and CSA safety standards. All wiring complies with NEC. Each unit is furnished with a sealed, UL approved power cord and plug. Water cooled condenser option to air cooled. Rejects the heat output into the water instead of the surrounding air. Eliminates the condenser fan. Ideal application is for make-up water to swimming pool.